In a closed-door meeting on infrastructure with members of both parties, President Trump tried to persuade his fellow Republicans that raising the gas tax should be an option for funding his infrastructure goals. The government needs money to fund much-needed upgrades to America’s roads and bridges. The proposed increase of 25 cents could be phased in over the next five years by hiking the tax 5 cents each year. The increase is expected to cost the average motorist about $9 a month. This is a reduction of the 50-cent increase in the gas tax Trump initially pitched to lawmakers at the end of last year. The gas tax is currently 18.4 cents a gallon and hasn’t been raised since 1993. The gas tax is currently the biggest source of money for federal infrastructure spending. It has been a pretty successful and durable means over the years for paying for roads, bridges and other useful transportation infrastructure. Some that attended the meeting expressed surprise that a gas tax increase was on the table for solving the funding issue. Sen. Thomas R. Carper (D-Del.) said that he supports the measure. The U.S. Chamber of Commerce, a powerful business lobbying group, says the proposal would raise $394 billion and that neglecting to address the deteriorating American infrastructure is costing businesses and families money. Republicans opposed to the proposal say that they don’t want to add anymore to the debt. Increasing the price of gas at the pump could be seen as a violation of the pledge many Republicans have taken to oppose tax increases. 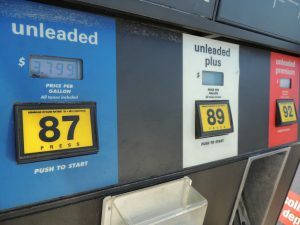 Others are wary of raising taxes at the pump so soon after passing major legislation to reduce taxes on businesses and families. Sen. John Barrasso (R-Wyo. ), chairman of a key Senate committee working on infrastructure, said that a gas-tax increase is a nonstarter. A major tax cut and spending increase passed by Trump and the GOP-led Congress have put the country on track to run $1 trillion deficits for years to come. However, the infrastructure spending plan recently unveiled by the White House doesn’t include much federal spending on infrastructure. The White House plan also recommends accelerating a shift to toll roads by giving states more leeway to charge tolls on interstate highways. Those tolls would be reinvested in other transportation infrastructure.